Mini-Session: If you want a shorter session and just a few preview images, call me to discuss your needs. Add $100 for travel to Eugene or Portland. Prints and digital images are purchased separately. When can we view our images? Within two weeks of your session, you will have access to an online gallery from which you can order digital images or prints. You can share the gallery link with your friends and family, and they may order as well. Yes! I edit all the pictures I sell. My editing is what makes the difference between a nice shot and an amazing picture that you'll want to hang above your couch. With adults, I can occasionally get perfection straight out of the camera, but there are still ways to improve the image. Kids' sessions are more free-flowing -- which means I might need to delete a distracting twig or paint out a streak of sunlight on your daughter's nose. My editing gives you beautiful pictures without distractions, focused on you. Go to the Editing Examples to see Before and After examples. If you want a specific edit, call me. Session fees are due when your session is scheduled, and print/image payment when the order is placed. If you order via email or phone, you may pay with check or cash. If you use the website Shopping Cart, Paypal. Do you offer an early-order discount? I do! If you order and pay for within 10 days of the gallery date you'll get a 10% discount on prints! Typically I allow three to four hours for newborns and one to two hours for other sessions. Seniors can choose either a standard session or a longer session, and those longer sessions can be broken into two different days. Lots of play time -- lots of time for you to relax into your natural expressions. 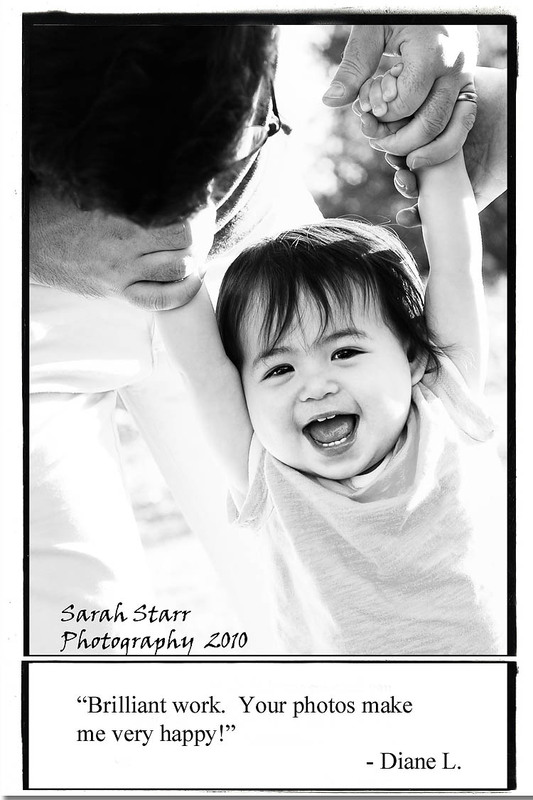 "[Sarah] started playing with my son immediately and taking the pictures seemed so natural. At one point she was a gorilla and my son was a zookeeper. My son didn't want the photo shoot to end and the pictures are amazing!" - Mirinda K.
Natural outdoor lighting (especially in the morning or late afternoon/evening) creates amazing photos. I provide backdrops and secondary lighting as needed for newborns. Where should we take my pictures? I offer both on-location sessions (mostly for newborns) and outdoor sessions. Where do you love to go? What's special to you? In Salem, Deepwood and Bush Park are lovely. Downtown Salem offers a wide variety of urban backgrounds from brick walls to stone bridges to alleyways with graffiti. Do you have a favorite place? I'll work with it! Before your session, we'll talk and figure out what will highlight you best. For newborns, I suggest your house. New mamas need to be comfortable! I'll come to you, set up, and wait until the baby is happy or asleep. Please see the Newborn tab for more info on newborn sessions. You choose. For casual, completely unposed shots, I'll ask you to face a certain direction, and we'll take it from there. With toddlers and preschoolers, my preference is unposed shots, spontaneously capturing their nature. My goal with posed portraits of any age is to capture you at your best, and I enjoy taking my time, talking with you, and taking photos as you relax. With toddlers in dresses, I bring bloomers to hide the diaper. What is most important to you? If you're an avid knitter, bring your current project. Or how about your gardening hat and shears? For your kids, grab that well-loved blanket, kitty, or favorite truck. It makes them happy and helps capture the true memories that will make you smile years later. When you schedule your session, we'll talk more about what clothes and props make you comfortable and make your photos special. After the session -- then what? What will I, the parent, be doing? With newborns and infants, you'll be playing "catcher," sitting near the ottoman in case your baby rolls. If two parents come, one can help draw the baby's attention. I'll have noise toys, but your baby loves you the best. If you are trying to draw the baby's eye toward the camera, you will need to be immediately behind me, down low. With older children, just relax. With a shy older child, I take extra time to get to know him or her. Rambunctious? Great! Energetic kids have lively, candid expressions. If they're relaxed and enjoying themselves, your kids will be more apt to grin over at me when I call their names or ask them a question. Mostly, they'll be playing with me -- or, for a family session, with you. Being the center of attention might make your child clingy or silly, and we can offer a break or a snack -- but sometimes these silly photos are the most fun! Whether you want a quick mini-session with you and your kids for a framed Father's Day surprise or a three-hour celebration of the magic of your newborn's tiny toes and amazing blue eyes, I look forward to capturing pictures you’ll treasure.